Trapezohedra satisfy this “convex and isohedral” rule, and the pentagonal trapezohedron is commonly used as a d10 (see the picture above). Trapezohedra work best with 10, 14, 18, … sides, since then pairs of faces can be parallel, and there can be an unambiguous “top” number. The cube can be seen as a special case of a trapezohedron. Some Catalan solids, like the pentagonal icositetrahedron, are unsuitable as dice because there is no unambiguous “top” number. On the other hand, there are some additional variations that are isohedral, like the hexakis tetrahedron. For more on this subject, see Alea Kybos’ impressive dice page. The beautiful Noctilucent clouds (photo above by Kevin Cho) are slightly misnamed. The name means “night-shining clouds,” but in fact they are only visible between the end of civil twilight and the end of astronomical twilight (and at latitudes north of 45°N or south of 45°S). Noctilucent clouds are the visible form of polar mesospheric clouds, made up out of ice crystals in the normally very dry almost-vacuum at extremely high altitudes, around 80–90 km up (see NASA image of a polar mesospheric cloud above). Noctilucent clouds were first identified as a distinct atmospheric phenomenon in 1885 (see the Google ngram below for uses of the phrase). The ice crystals from which noctilucent clouds are formed require both water vapour and dust for crystal growth nuclei. The sources of these ingredients is still mysterious, although at least some of the dust may come from meteors. Yet another atmospheric phenomenon for the bucket list! Update: it seems that Scotland has voted to remain as part of the UK. The burette, an important volumetric tool, was invented by Karl Friedrich Mohr somewhere around the middle of the 19th century. There had been other devices carrying the name “burette,” but they required pouring. Mohr introduced a rubber tube with a clamp that allowed the gradual drop-by-drop flow needed for titration (the clamp was later replaced by a tap). 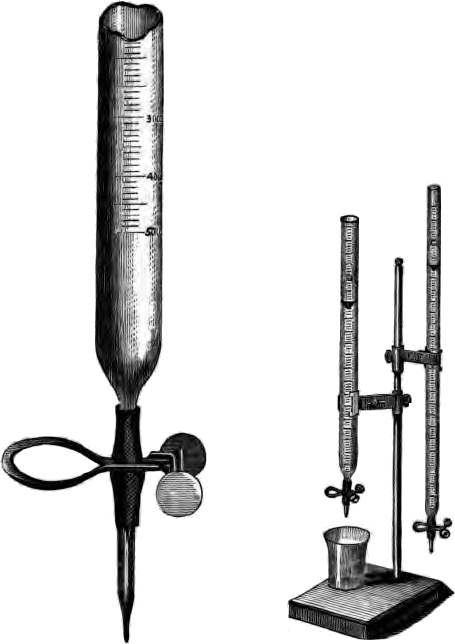 Mohr’s 1855 book on titration, which illustrated the device, helped it to become the key item of analytical equipment it still (in spite of more modern digital devices) is today. Thanks, Karl! Once again, a Google ngram summarises the history, with the word “burette” rapidly gaining popularity from 1855, but being replaced by the word for the process, which itself faded after 1960 – perhaps because of the growth of other kinds of science. Above is one of the nifty atomic emission spectrum scarves made by Becky Stern. An emission spectrum is the pattern of light colours produced by heated atoms, and the emission spectra of different chemical elements act as a kind of visual “fingerprint.” There’s something wonderfully geeky about putting one on a scarf – and they look great too. Becky Stern no longer seems to sell these scarves, but has posted patterns for making your own. More pictures here. A recent paper in PLoS ONE (by Jean Just, Reinhardt Møbjerg Kristensen, and Jørgen Olesen) reports the new species Dendrogramma discoides (marked with asterisks in the image from the paper above) and Dendrogramma enigmatica (unmarked above). These species were found in waters off south-east Australia. Specimens from this new genus were collected in 1986, and preserved in formaldehyde. This is a pity, because the organisms have not been found again, and the formaldehyde has destroyed their DNA. DNA analysis would have been useful to work out in which animal phylum to place Dendrogramma. The usual candidates (left to right above) are Porifera (sponges), Ctenophora (comb jellies), Cnidaria (jellyfish), and the Bilateria – such as Echinodermata (which are bilaterally symmetrical as larvae) or Chordata. The fascinating Dendrogramma specimens are not bilaterally symmetrical, and are not sponges. They lack specialised features of the Ctenophora and Cnidaria, such as Cnidarian stinging cells. So what are they? It seems likely that either a new phylum has to be defined; or that Dendrogramma must be placed in a restored Coelenterata (a former phylum which once contained the Ctenophora and Cnidaria); or that the boundaries of Ctenophora or Cnidaria need to be extended – but without DNA, the decision is difficult. Updating Ebola news, the map above shows the current situation in West Africa. 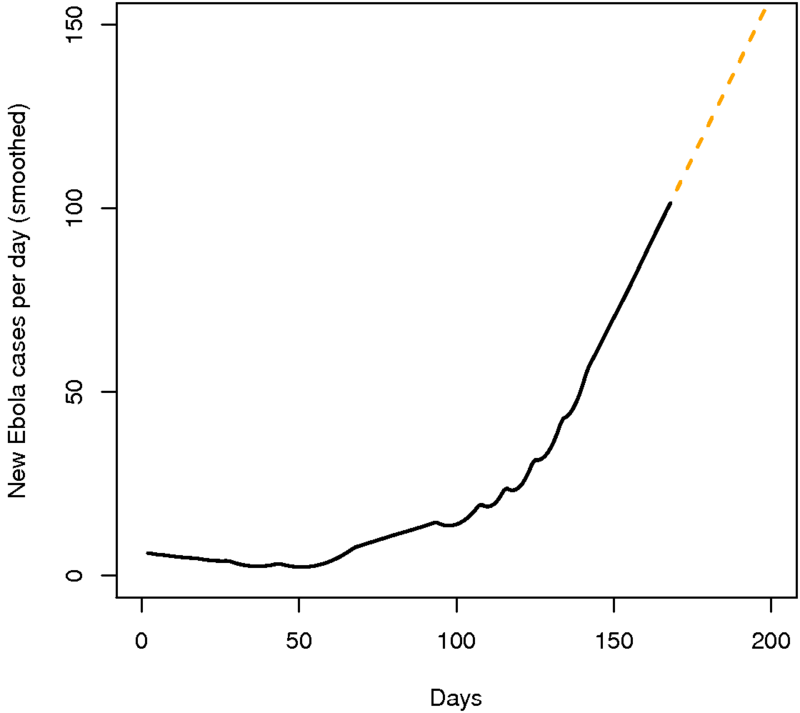 The graph below shows cases to date (with LOESS smoothing). 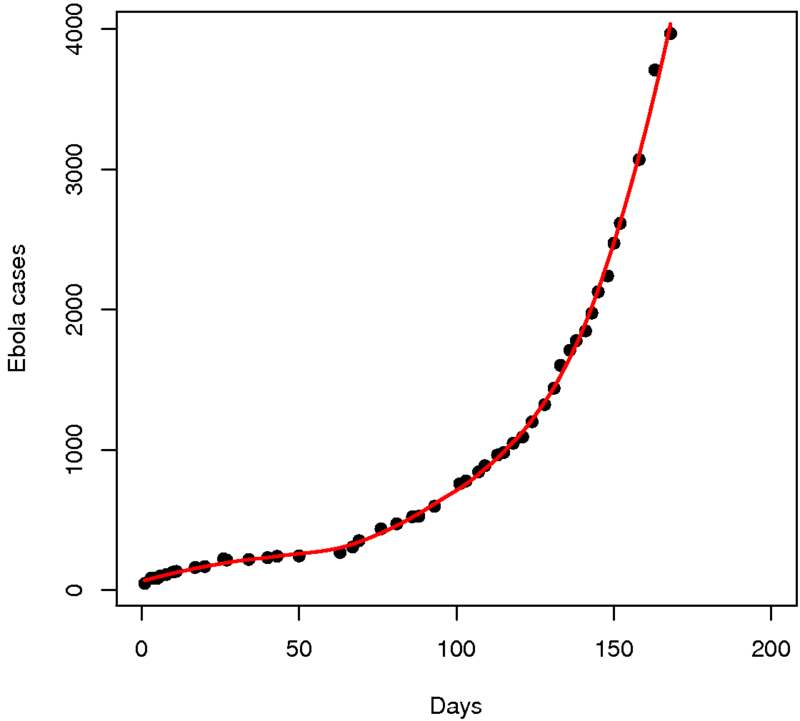 Below is an estimate of the new cases per day (calculated from the smoothed data). The acceleration of the disease appears to be continuing, which is very disturbing. See the WHO and CDC websites for more information.